This post originally appeared in Flypaper, the Fordham Institute’s blog, and is re-posted here with permission. E.D. Hirsch, Jr. turned ninety years old two weeks ago. And the state of Louisiana has given the Cultural Literacy icon and architect of the Core Knowledge curriculum a belated birthday present. In a little-noticed press release issued Monday, the state’s Department of Education announced its plan, under a provision of the federal Every Student Succeeds Act, to develop and pilot a “streamlined English and social studies assessment….that align[s] with the knowledge and books taught in Louisiana classrooms.” Unlike most reading tests, which ask students to find the main idea or make inferences on reading passages about random topics, Louisiana plans to create test items on books and topics test-takers have actually studied in school and try them out in five school districts in the state, including two charter school networks. Background knowledge is the main driver of language comprehension, whether written or spoken. Disadvantaged students are disproportionately dependent on schools to provide the background information that will make them effective readers because wealthy students have greater opportunity to gain this knowledge at home. Researchers have consistently demonstrated that in order to understand what you’re reading, you need to know something about the subject matter. Students who are identified as “poor readers” comprehend with relative ease when asked to read passages on familiar subjects, outperforming even “good readers” who lack relevant background knowledge…Such findings should challenge our very idea of who is or is not good reader. In sum, what Louisiana proposes to experiment with is something of an assessment Holy Grail: a reading test that incentivizes the kind of teaching and learning disadvantaged students need to close pernicious achievement gaps in ELA. Keep that in mind next week when you hear the inevitably depressing results on NAEP reading. The Louisiana proposal is a modest one, limited to five school districts and charter networks in the state. Modest, but portentous. For the first time, the education leadership of a U.S. state has demonstrated in its assessment policies a grasp of the foundational idea that English language proficiency is not a “skill” like throwing a ball or riding a bike that can be taught and tested in an abstract, content-agnostic way. The pilot signals the critical awareness that language-proficiency is knowledge dependent, and that educational equity is not served by ignoring this or trying to wish it away. I suspect the pilot may get more attention for reducing the number of tests students take and for spreading them out over the school year, so that students are assessed immediately following a unit’s completion, leading to a cumulative score. But the longer-term win is to drive home the connection between broad general knowledge and broad general reading ability. 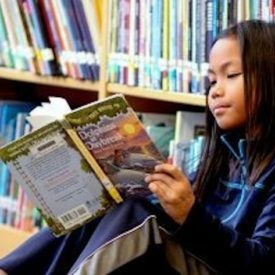 Once established, that has the potential to have a dramatic impact by challenging the long dominant skills-and-strategies approach to reading instruction in favor of one that sees knowledge development in children—particularly disadvantaged children—as the indispensible Job One of reading instruction in American classrooms. Bravo, Louisiana. And happy birthday, E.D Hirsch, Jr.
Wow! What a fabulous concept! Please bring this idea to all states. The success rate for students should go up considerably when the test has value. I personally have been an educator for 10 years now and I am so intrigued with this concept; it is so interesting and beneficial for the children to have Louisiana have each student be tested on current books in their school. From my own personal experience, I have found that for my students reading information and making connections is essential in their learning. This concept should also be in Texas. 1. Will this assessment be given after every unit in ELA and Social Studies or at the end of the school year? 2. Does this assessment evaluate students reading comprehension or fundamental reading abilities (decoding/word recognition)? 3. Will students with IEPs be able to use their accommodations, such as text-to-speech or verbatim reading? I am curious to see the results of the pilot schools, as this will give insight into what is most needed in our local and state assessments. I taught for 25 years and this is the first time I have seen some merit behind the idea. I can remember giving southern low income students a standardized test which included questions about cellars and furnaces in the cellar. What? Kids raised in the low areas of Louisiana can be told about cellars but have no idea if they have never seen one. Students spend so much time working on testing skills that they miss the really good stuff. I used stories about the buffalo soldiers and reading about the Titanic. These things interested all the students. We need to teach for the love of reading and quit testing, testing, testing. Get the college students into classrooms much sooner. They need to know what their duties will be. We need their help. I have been teaching for seven years now and I think this idea is GREAT! Many of the students that I teach have to go back and research the text that they are reading because they have little to no prior knowledge of what the story is about. Simple things like kayaking, canoeing, or rafting are foreign to the students that I teach. It takes at least a week to teach them everything that they will need to know to be able to read and comprehend the text. This new test will show that they are using what they know. I have taught in a Connecticut elementary school for 15 years and I agree with your comments about teaching what students have background knowledge of and some interest in. I recall a test that included a beach scenario and many of my students of color had never been to the beach. Abstract concepts are not going to hold meaning for students, and I am afraid this continued testing will deter them from a love of learning. I love this proposal. I have taught students who read significantly below grade level for 3 years now. They are expected to take a standardized test covering concepts and standards in the spring that they have not mastered, or even been exposed to, because of reading curriculum that we are mandated to teach. Teachers have to bridge the gap and build upon the student’s lack of phonics skills and/or phonemic awareness skills. Testing over texts or passages that do not resonate with young people produce scores that are not equivalent to what they may or may not know and understand. I think this proposal is a fair opportunity to display all students’ knowledge of particular books and will give a truer picture of what children know and don’t know. This is a wonderful concept. Oftentimes, students test on material they have not necessarily learned, and therefore the test are not a true representation of students’ knowledge. Additionally, because some students lack stamina or have other educational concerns, they are not necessarily able to focus on passage that have no relation to their knowledge base or interest. As a result they may not read as carefully as they should. Testing students on topics of interest and topics that are familiar to them from their learning should help to see test score increase. It can also have a positive impact on students self-worth who feel they are doing all they can to pass high stakes test and are consistently not doing well. This sounds like an interesting concept as taking standardized test has been difficult for those that may teach in a low income/socioeconomically disadvantaged area. This may boost the confidence of students that may feel like failures when they must take a state exam and be compared to all students of the state.